Discuss about Programming for PHP, Mysql, Raspberry PI, Computer troubleshooting, Blogger Site Design Services. There are three basic file systems in windows. They are FAT, FAT32, and NTFS. 1. FAT system divides sectors of physical disk (eg. hard disk) into allocation units called clusters. 4. Maximum size for FAT16 is 2GB. 6. 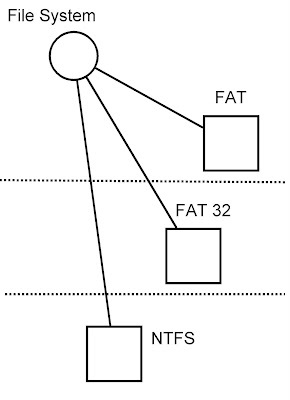 FAT's attributes is simple - one byte and eight possible attributes. 7. Works well with small partitions that have relatively few files. 1. It is the FAT system with 32-bit number internally. 2. It is not designed to operate with fewer than 64K clusters, but can go up to 232 cluster (about 4 billion). 3. FAT32 needs a larger cluster size only when partitions reach 2TB. 4. FAT32 can be used only by windows 2000, Windows98 and Windows95 OEM service release 2. 2. The major difference with FAT system is that the information about file allocation is not stored at the start of the partition. 3. Provides support for links within the file system. 4. NTFS has the capability to support very large file systems. a. Logon - every user must uniquely identify themselves. b. Ownership - every resources on the system owned by a user. c. Permission - resource on system is at the discretion of its owner. d. Auditing - any permission that has been granted is recorded. 6. NTFS is the only file system that supports local security. What is TCP and UDP? Take a deep break, Delicious, Yummy.. Enough with pendrive /thumbdrive virus!! Eric Lim @ 2008-2014. Powered by Blogger.